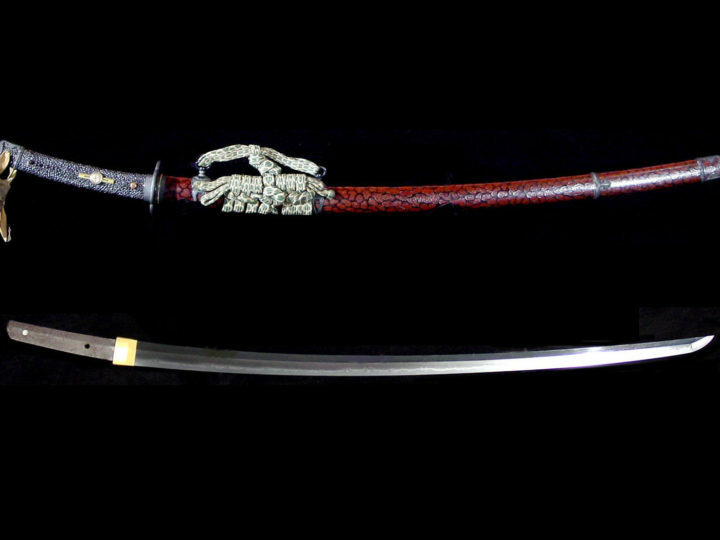 The term, uchigatana (打刀), is made up of two Japanese words. The word, uchi (打), comes from the verb, utsu, and means to strike. The word, gatana (刀), is another reading of the word, katana (刀), and means sword. Thus, when these two words are used together, this term, uchigatana (打刀), means a sword that is suitable for striking an enemy. Used in this context, it means a sword that is worn with the cutting edge upward as opposed to a tachi that is worn with the cutting edge downward. Wearing the sword with the cutting edge upward, allows the user to draw the sword from its scabbard and strike an enemy with one continuous motion. This is as opposed to a tachi that requires a double movement of first drawing the sword and then reversing its direction to strike downward on one’s opponent. (打刀拵) of this period seem to be the type of mounting later called chiisagatana koshirae (小さ刀拵). Chiisagatana (小さ刀) means small sword. It was not until the Muromachi Period of the late 14th to early 15th centuries when generals and samurai began to use them to supplement their tachi, that uchigatana (打刀) of quality were made. This general shift in weaponry was due to a major shift in battle tactics wherein large armies of foot soldiers met face to face on the battlefields. Prior to this, a typical battle would consist of duels between two individual mounted samurai fighting from horseback with tachi (太刀). The uchigatana (打刀) developed out of the ever-increasing need for speed in combat, and its rapid acceptance is clear evidence of the degree to which fighting had become fiercer and more intense in the early fifteenth century. The ability to have the draw and strike as one motion could mean speed and the difference between life and death. Uchigatana (打刀) whose mounts frequently included a sword guard, but sometimes did not, were forged in both long and short lengths. We also see the beginning of blades with saki-zori with the curvature higher on the blade to help the ease of the “sky to ground” draw of the uchigatana (打刀). Blades with a length of over sixty centimeters were called katana and those of less were called wakizashi (脇指), i.e. companion sword. 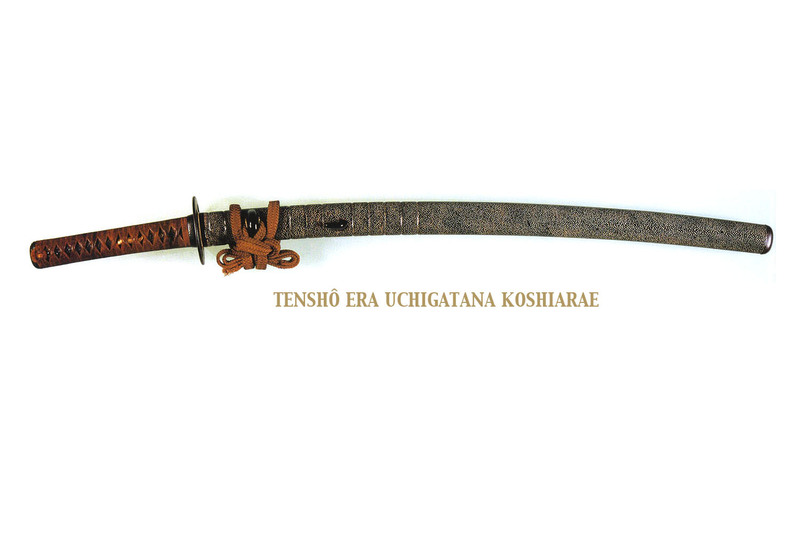 As we stated, with a new shape in blades came a new style of mounts and thus, true uchigatana koshirae (打刀拵) were born. Uchigatana (打刀) were worn with the cutting edge upwards and thrust through the sash. They were built for speed and ease of drawing and striking in one motion. These types of mounts are also referred to as Tenshô koshirae (天正拵) as they were typical of the type of koshirae (拵)worn during the Tensho Period (1573-1592). We also find them referred to as koshigatana (腰刀) or hip katana, as they were worn on the hip as opposed to being slung from the waist. It is difficult to distinguish between koshigatana (腰刀) and uchigatana (打刀) since both have much the same features. One opinion is that uchigatana (打刀) are equipped with a sword guard when mounted and a koshigatana (腰刀) was not. This is not always true. Also, equally confusing, originally the term uchigatana (打刀) was applied to both a blade and the mountings, but in recent years the blade alone is called the uchigatana (打刀) and the mountings are called the uchigatana-koshirae (打刀拵). Typical features of uchigatana koshirae (打刀拵) of the Muromachi Period, especially those that we call Tensho koshirae (天正拵), are a handle covered in black lacquered same, a simple low profile fuchi with angled sides, a leather wrap that is frequently lacquered and a black lacquered horn kashira with the wrap passing over its top. The menuki are typically from Ko-Goto, Ko-Kinko, or Ko-Mino Schools, or done in the style of those schools. The saya is usually wrapped in leather and lacquered black, which sometimes fades out to become reddish brown. Momoyama period saya are often red, or make use of a thin gold sheet. Some same saya of very fine grains are also seen. The kurikata are rather close to the sayaguchi and rounded. The distance between the kurikata and the kaerizuno is not great and the kaerizuno typically point almost straight toward the kurikata. A pocket for a kogai is also typical with the kogai also being from one of the three schools mentioned. The sageo is usually made of leather. Most have tsuba that are typically made of iron, but occasionally some mountings do not have a tsuba (often called a koshigatana koshirae (腰刀拵), but not always). It has always been the practice that Japanese sword blades of excellent quality were cherished, well cared for by their owners, and handed down through the generations. Therefore, we have a considerable number of old specimens today. This was not the case with koshirae. Koshirae changed their style with the times and old ones were likely to be discarded for new ones as they wore out from use or went out of style. Many of them were made of lacquered wood and were not meant to last very long. 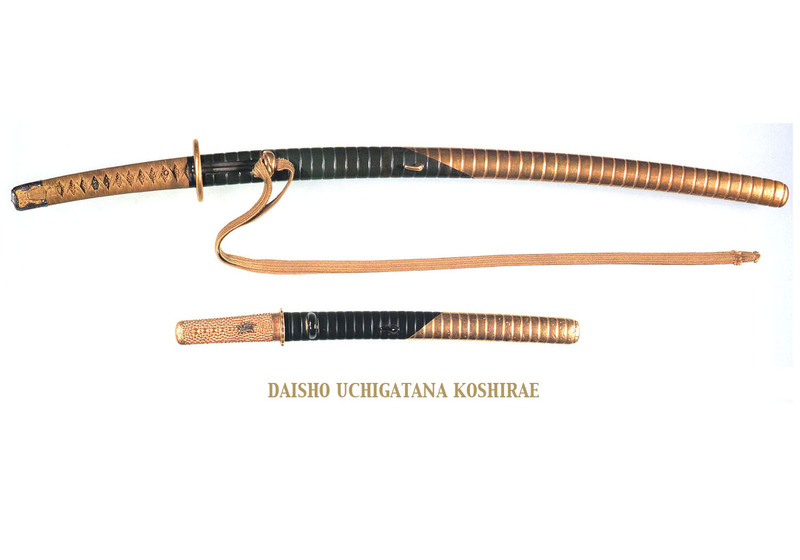 For these reasons, existing examples of old koshirae are few and precious. 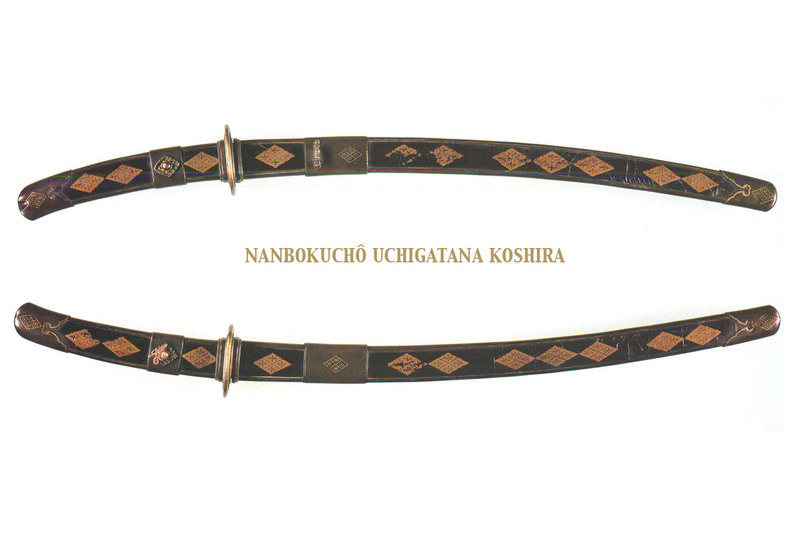 Keep in mind that while to this point we have been referencing uchigatana koshirae (打刀拵) as a new type of koshirae that came to life in the Muromachi era due to of changes in battle tactics, sword shapes, and fencing styles, we are really talking about all Japanese sword mountings that were worn cutting edge upward and thrust through the sash. Thus, to follow this thought to its logical conclusion, we must also consider as uchigatana koshirae (打刀拵) all koshirae worn in this fashion throughout the Edo Era up until the Meiji Restoration. We know that after the Momoyama Period when relative peace was restored to Japan, swords took on a new and social purpose as badges of rank and status. Styles, while they are still considered to be uchigatana koshirae (打刀拵) no longer fit the mold of the traditional Tensho koshirae (天正拵). Even as early as the late sixteenth century when Toyotomi Hideyoshi unified Japan, many of the war generals wore mountings with gorgeous decorations that reflected their tastes. Since these high-ranking samurai were respected and they often established lineages that lasted for long periods of time, mountings used by them have been carefully preserved as heirlooms and they are still in existence today. We must be careful not to assume that these koshirae made up the mainstream of koshirae during this period, as most that belonged to the “average” samurai have been lost to time. 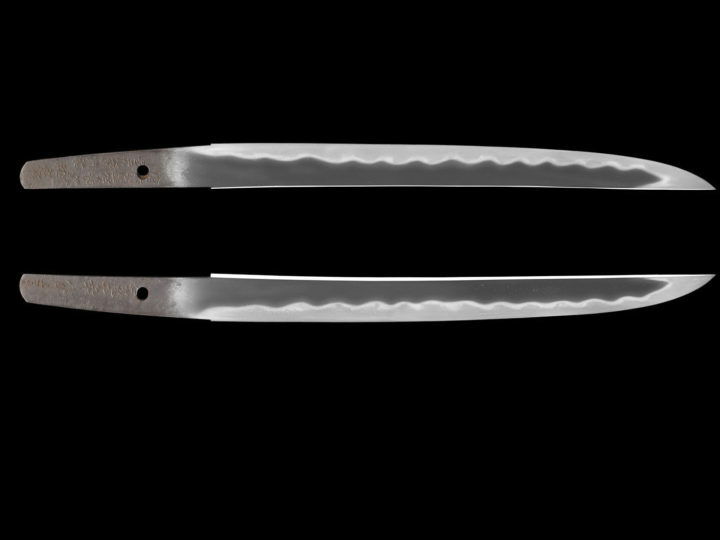 A pairing of an uchigatana koshirae (打刀拵) with a wakizashi koshirae (脇指拵) having the same metal fittings, lacquer coating of the saya, and hilt wrapping are called a daisho koshirae (大小拵). Although there was a custom of wearing a tachi (太刀) together with an uchigatana (打刀) or koshigatana (腰刀) before the Muromachi Period, it was not until the Momoyama Period that what we know today as the daisho koshirae (大小拵) came into being. This was a time when the formal garment of the samurai became a set of kata-ginu (stiff sleeveless robe worn over a kosode dress) and hakama (a kind of loose skirt/trouser with flared bottoms). Around the time of the creation of the daisho koshirae (大小拵), a mounting called the handachi koshirae (半太刀拵) appeared. Worn thrust through the sash but with the cutting edge down, they could also be called uchigatana koshirae (打刀拵) in a wider sense. There are several types including one with the kurikata on the side opposite the side of the one on the typical uchigatana koshirae (打刀拵). There was also a style of handachi koshirae (半太刀拵)with only one ashikanamomo (metal fitting to which the suspending cord is attached), and another whose second ashikanamono near the closed end of the scabbard was loose and able to slide toward the other. This was done so that when the sword was worn like an uchigatana and not worn slung like a tachi, it would not become an encumbrance. TSUKA Tsuka are covered in same (the skin of a ray fish like a sting ray). This allows a firm grip and protection for the wooden handle that is underneath. Most tsuka made before the Momoyama Period have the same covered with a coat of lacquer while those after do not. There are two fittings on either end of the tsuka, a kashira at the end of the tsuka and a fuchi at the opening where the tang of the sword is inserted. The early uchigatana koshirae discussed often have plain horn kashira with the tsuka ito (cord wrapping the tsuka) tied over the top of the kashira. SAYA The sword scabbard or saya is generally lacquered black. Since the Muromachi Period, however, we find high ranking generals and Daimyo having their scabbards decorated with nashiji, ikakeji (make-e techniques using fine gold particles) red lacquer, and even ray skin. The Momoyama Period saw scabbards decorated in lavish designs and this trend continued into the Edo Period. KURIKATA, KOJIRI, AND KAERIZUNO Kurikata, a loop on the scabbard through which the sageo cord is pulled is commonly made of horn. There are also examples of metal specimens, which seem to be prevalent on koshigatana koshirae. Kaerizuno is a kind of hook keeping the scabbard in place in the sash when the sword is drawn. Those made of metal are called origane. 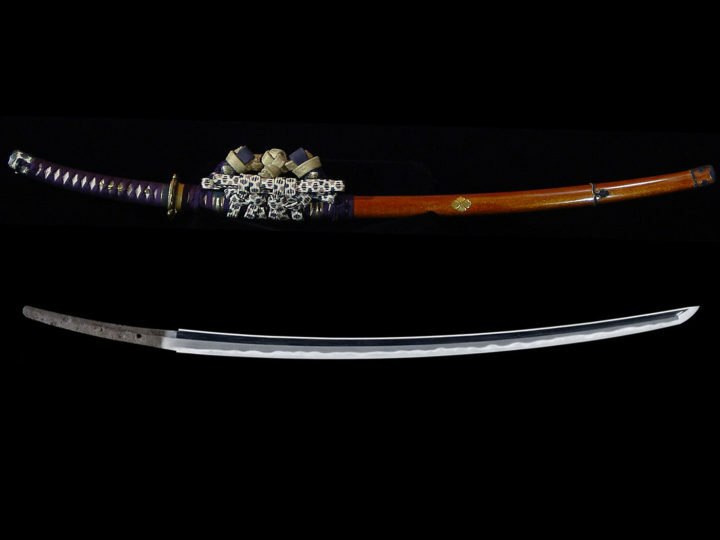 Kojiri, the fitting over the closed end of the scabbard, can be either horn or metal. There are some scabbards that do not have kojiri. This is usually true of the wakizashi koshirae. HABAKI In the Kamakura Period, sword smiths, when they made tachi blades, seem to have made iron habaki that were called tomo-habaki. As these were replaced with later pieces almost none of them survive today. 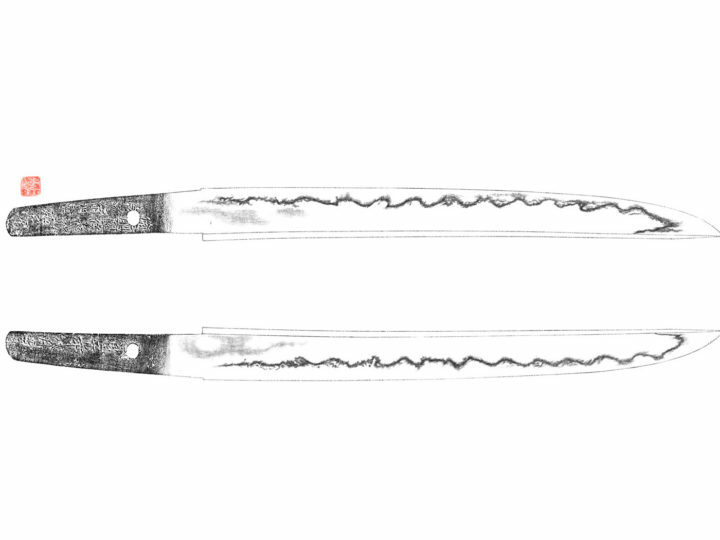 It was common practice in the Muromachi Period to have single habaki put on swords with tsuba and double habaki on swords that were mounted as koshigatana without sword guards. The Edo Period changed this custom to one in which single habaki were put on shinto swords and double habaki on koto swords. MENUKI Menuki first appeared on tachi mountings. They developed from mekugi that was the pin that is used to hold the tsuka onto the tang of the sword. They later became extremely decorative while serving to help improve the grip of the swordsman on the tsuka by creating strategically placed bulges in the handle at the point of a person’s grip. KOGAI The kogai is a decorative fitting that is based on a woman’s hair ornament. It dates to the Heian Peiriod. The long end is used as a kind of comb for one’s hair while the cupped end is used to pick one’s ears. It is not known exactly when it became a part of sword furniture but seems to have appeared on the koshigatana koshirae first and on the uchigatana koshirae later. KOZUKA This is a decorative handle for a utility knife that, like the kogai, fits into a small pocket on the side of the scabbard near the opening for the blade. A small blade called a ko-gatana fits into the handle. Of the menuki, kogai and kozuka (mitokoromono), the kozuka was the last to appear. Early sword mountings such as koshigatana and uchigatana koshirae have kogai but no kozuka. 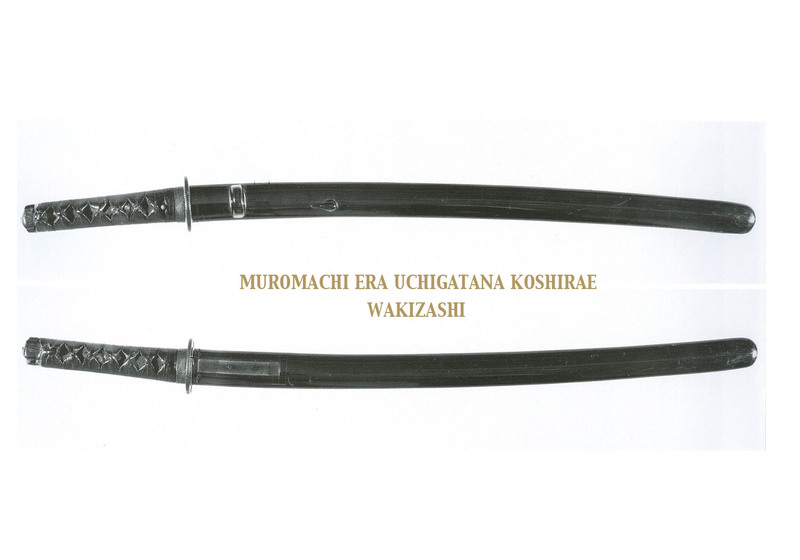 The use of a kozuka became more prevalent with the introduction of the wakizashi in the Muromachi Period. To be sure, there are existing mountings from the Muromachi Period with both the kozuka and the kogai, but it was the Momoyama Period that brought about the widespread use of mitokoromono of the menuki, kogai, and kozuka all being mounted on the sword. 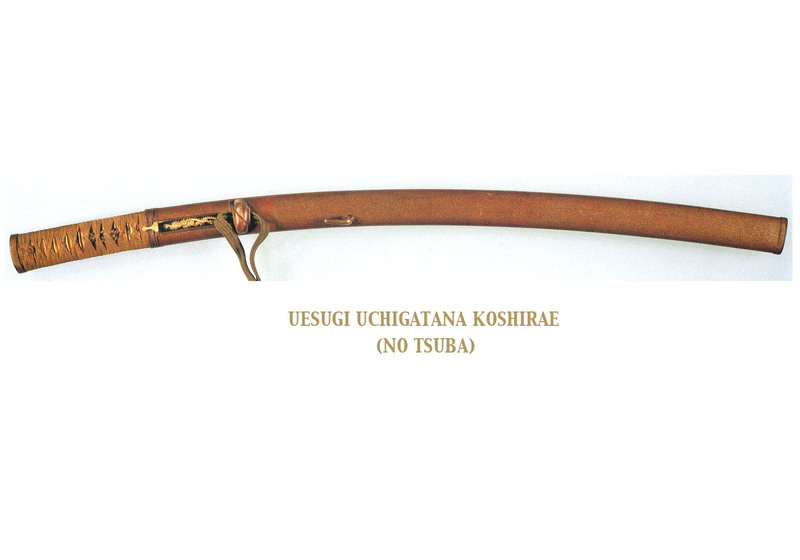 This has been a short diatribe as to the development of the uchigatana koshirae and, as such, is not meant to be all encompassing. I would hope that it serves as a basic primer for the new student and a jumping off point for the more advanced student of Japanese swords.